Howard and I drove to the Lakes to run the Great Langdale Half Marathon, the hardest half marathon in the country, yet again. The weather forecast was sunny but cool and the Lake District looked stunning in the sunshine. We met Eleanor Shotton before the start doing, I think, her first half marathon. The course is hilly in the extreme so we both set off sensibly with Erika Johnson of Swaledale Runners a short way ahead. At around three miles we caught and passed her. At about four miles Howard left us on the down-hills at which he excels. She later passed me and I then passed her until the steep hill out of Skelwith Bridge where will-power deserted me and I began to walk and she passed again. Twice I stared running, caught her and then walked again. I almost caught her again coming down the steep hill to the Chapel Style road at Elterwater with three undulating miles to go. 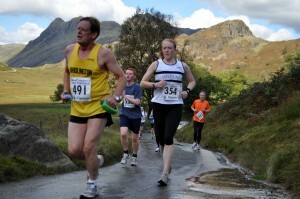 I ran steadily as my left calf was tightening and managed to rein her in at around twelve miles. I tucked in for a few hundred yards and pondered where I would kick for home. Unfortunately as soon as I sped up to pass my calf began to cramp badly so I was left with no option but to slow down and shuffle to the finish. I finished 50th in 1.42.34, first mv60, eight minutes ahead of my nearest rival. Howard finished in 34th, in 1.37.10, first mv55, also eight minutes ahead of his nearest rival. Eleanor finished 199th in a very creditable 2.02.33, ninth in her category and Erika finished 48th in 1.42.25, second in her category. The race was won by Steve Littler (Wesham) in 1.19.52 and the first lady in 22nd position overall was Molly Ralphson (Trawden) in 1.35.45. After the prize giving we spotted Nick Hodgkinson starting his second lap of the marathon. What a glutton for punishment he is. I’ll let him tell you his time and position! (although the results show the race was won by Steve Prentice (Bellahouston Harriers) in 2.57.28 and the first lady was Nicola Shaw (Unattached) in thirteenth position with 3.28.27 and Nick was 165th in 5.23.07). Later that evening I looked at past results and was pleased to see in 2003 I ran 1-32-06, first mv50. I also checked out the winning mv60 time and was aghast to see Phil Robinson winning in 1-40-23! All in all a very successful trip. 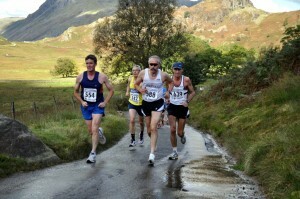 From ukresults, half marathon results here and full marathon results here. Photos including these showing Howard just ahead of Mick and also Eleanor courtesy of Andrew Thrippleton here. Well done to all members taking part in both events and yes, a big well done to Nick on completing the Marathon. What a contrast between Langdale and KSA! Great effort chaps, sounds a great race. Ideally located next to wonderful views and pubs! Well done Eleanor, what a first half marathon to do! !